Buddhism is the most common religious in Thailand with approximately more than 95% of the population following this religion. Thai Buddhism population is largely of the Theravada traditional, which tend to be very conservative and strictly followed doctrine and monastic discipline. 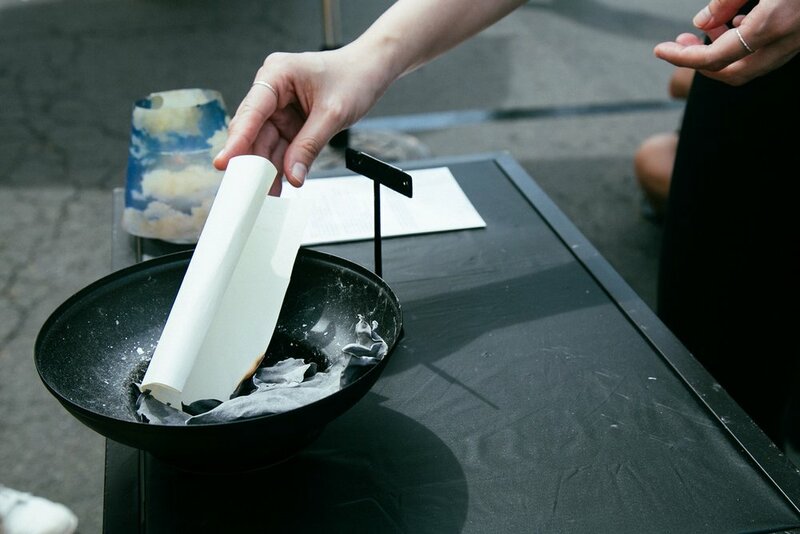 Using fluxus’s anti- aesthetic, same as street orders and instructions, with a twist of Buddhist traditional ways of merit making, the artist invites the public to write their stories, conversations, memories or even news that they wanted to forget or let go in the providing space. In this strange facsimile street temple, Suphitcha addressed the problem of finding inner peace in this mad age of over-information between the landscape of reality and fiction. Full Stop [ . ] is part of “What is a Point” event created by TANY (Thai Artist in New York) during Songkran Festival 2017 at Woodside Avenue, Queens, New York.